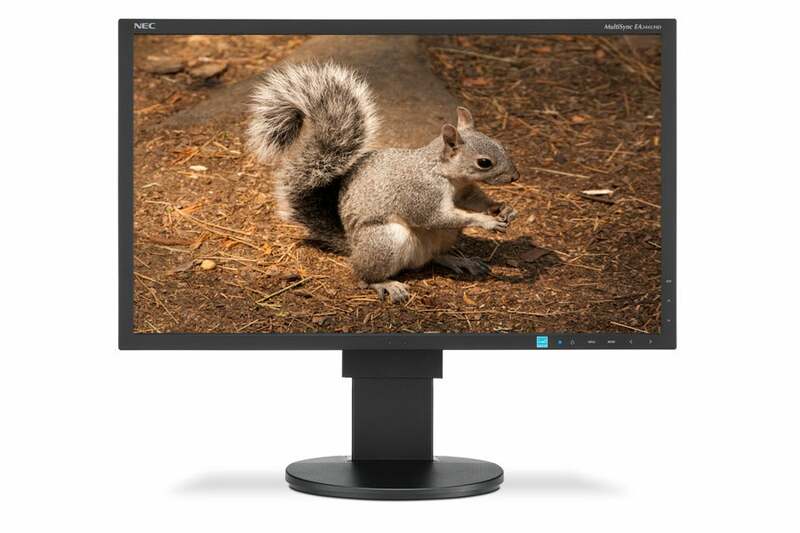 The NEC MultiSync EA244UHD is a 24-inch, 4K desktop monitor. Priced around $1350, the EA244UHD may be expensive, but when connected to a new Mac Pro over Mini DisplayPort, its pixel-doubled resolution can provide you the desktop “retina display” experience not available from an Apple display. The EA244UHD is the third 3840 by 2160 (4K) monitor we’ve seen in the lab, and at 23.8-inches diagonally, its also the third different size we’ve seen. The previously reviewed Asus PB287Q is a 28-inch monitor and the Sharp PN-K321 measures a massive 32-inches, diagonally. The EA244UHD has an all-black case with vents all along the outer edge. The two previously mentioned displays have their vents on the back, further from the user. I mention this because I could feel a fair amount of heat coming from the EA244UHD during use. The EA244UHD is pretty thick, too; not that you see that when sitting in front of the monitor, but it does seem boxy when viewed from the side and near the Asus or super-thin Sharp display. The EA244UHD offers height adjustment and can swivel left and right. The stand provides a few degrees of tilt as well as the ability to pivot into portrait mode. The EA244UHD provides a wide range of connection options: two DisplayPort connectors, two HDMI ports, and two DVI inputs. The EA244UHD is one of the only monitors I’ve seen that comes with a DisplayPort to Mini DisplayPort cable. Such a cable comes in very handy when using with Apple’s line of Thunderbolt-equipped Macs. You can use the aforementioned connectors in conjunction with the EA244UHD’s Multi Picture mode displaying multiple sources side by side. You can also connect an external calibration device to work with NEC’s SpectraView II software, a $99 download. The software can create profiles of your display and make changes to the color lookup tables residing in the display, rather than your graphics card. The EA244UHD boasts wide color gamut with 99.3 percent coverage of the Adobe RGB color space, 94.8 percent coverage of NTSC color space, and 100 percent of sRGB. 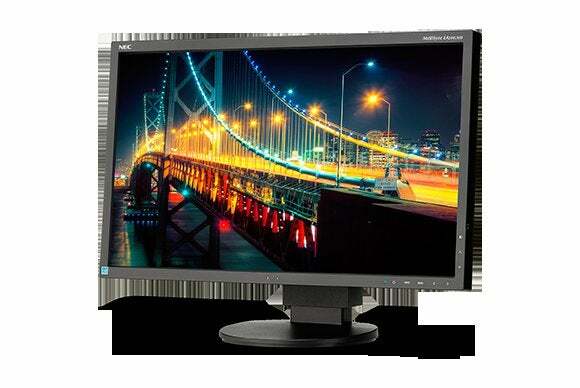 The EA244UHD uses a high-quality IPS screen and LED backlighting. Unlike most IPS displays, I did see some shifting in color as I moved up and down or left to right from the center of the screen, but the shifting was nowhere near as bad as the shifts on the Asus’s TN screen. When viewing from a few feet away, the whites take on a pinkish cast. Best to use this display as intended—sitting or standing in front of it like a standard desktop display. Text and icons look great when in pixel-doubled mode using OS X 10.9.4. Using the screen at full resolution is handy for viewing large images in Photoshop at full size or 4K video, but as you’d imagine, icons and user interface elements are very small when using the monitor at full 3840 by 2160 resolution. The EA244UHD was able to run at both native and pixel-doubled resolution at a full 60Hz when connected via DisplayPort to both a late 2013 Mac Pro and a 15-inch Retina display MacBook Pro. By default, OS X boots the screen into 1920 by 1080 pixel-doubled resolution. When opening the Mac’s Displays System Preferences Display tab you see two radio buttons for resolution: Best for display and Scaled. Clicking the Scaled button brings up five icons with resolutions ranging from Larger Text to More Space. Some of these resolution choices seem rather odd. The More Space setting, for example, does not set the display to its native 3840 by 2160 resolution, but to 3008 by 1692. The lowest resolution choice is 1504 by 846. Holding the Option key down while clicking the Scaled button will bring up a more complete list, one that includes the full resolution of the monitor. The 13-inch MacBook Pro with Retina Display only supports 4K displays at 30Hz. This slower refresh rate is apparent when moving the cursor around the screen or playing games faster than 30 frames per second. The EA244UHD features the company’s Human Sensor technology. As with the previously-reviewed EA274WMi, the EA244UHD has a sensor on the bottom edge of the bezel that recognizes whether someone is in front of it, or not. When no one is present, the screen dims. When it senses that someone is back in front of the screen, the display returns to its previous brightness settings. You can change how long the display waits before dimming, how dim the display goes when left alone, and how far away from the display to scan for a user’s presence. For those looking for a 4K desktop display, the NEC EA244UHD is definitely worth considering. It has a wide color gamut and looks great in its default pixel-doubled resolution. Its the smallest 4K display we’ve seen, which makes the screen elements even harder to make out in full-resolution mode. Remember that only 15-inch Retina MacBook Pros (2013 and later) and the late 2013 Mac Pro will support 4K at full 60Hz refresh rates.